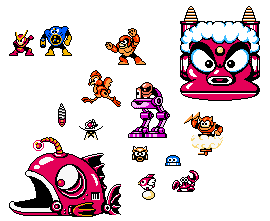 I did this a while ago but that list was outdated, now i have a new wishlist of enemies and bosses. I am aware that some of these may never be in the game, but these are what seem to be the most practical ideas. 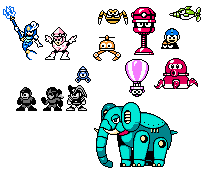 Since Mega Man 1 and 2 are nearly complete in terms of remaining enemies, i'd say just add every enemy that is missing from those games. Air Man would probably need some of his tornadoes spaced out and Quick Man would have to have his pattern be telegraphed and done in phases instead of randomly doing the jumps and attacks. Mole Spawners could work like placing rain, Pipi Spawners could work like Hoohoo Spawners, and Goblins/Air Tikkis could be set on 1-5 to have their horns go up and down on different intervals. You may be wondering why i put the Graviton on the wishlist despite reverse gravity being deconfirmed. The reason why it's on there is that i had an idea where the Graviton would be immune to Gravity Hold, and the Gravity Hold would flip the Graviton while keeping it in place. This could be used to make puzzle levels where you have to flip Gravitons. 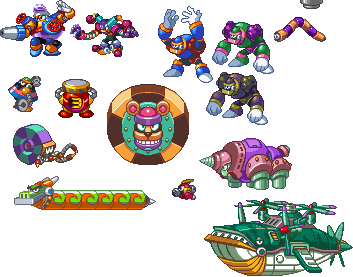 Grenade Man basically proved that wall jumping/clinging bosses are possible in Mega Man Maker, so why not Slash Man? 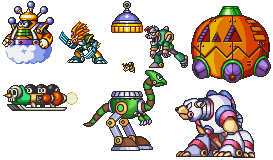 I'm not sure how hard it would be to make Clown Man and Kaizocks be able to latch onto Thunder Claw poles, but other that, they might not be too hard. 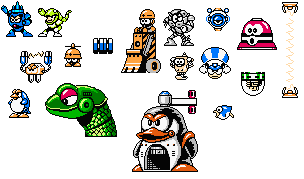 Oil Man sprite by the Rockman 7 and 8 FC Team, Shadow Bass sprite by me. These could be added if a second content loop ever happens. Last edited by UlticraftMTT on Thu Apr 18, 2019 10:52 pm, edited 7 times in total. 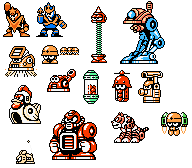 Well, Fire Man would be an awesome Robot Master to have in the game, in fact i want him in a bit more than Oil Man, but Fire Man being in Mega Man Maker has became a bit too much of a meme to be a practical addition. 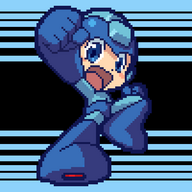 There was Heat Ladders, but it was added because the Heat Ladder meme died down, and the Fire Man in Mega Man Maker meme is still relatively active. I'm happy because here's Dive Man, Cactuspy, Snake Man and Lantern Fish. I don't see Slash Man making the cut. One of the decoomfirmed features are, "Specific bosses which don't play well with uneven terrain". Slash Man use the walls to wall jump in his boss battle. Everything else looks like it can fit well in. Yes, but think that if the man with the grenades can climb invisible walls like the cuts in the rooms, it will be the same with Slash Man later on.